Jörg Breu the Elder was a versatile painter active in the last quarter of the 15th century and the start of the 16th century. He produced religious and historical compositions as well as decorative fresco schemes and designs for prints and stained glass. He trained with Ulrich Apt the Elder and his early output reflects the influence of Jan Polack, Albrecht Dürer and Martin Schongauer. Towards the end of his career, however, his style moved towards Mannerism. The double portrait was a common format in German art, and the Thyssen-Bornemisza Collection includes several examples. The two figures on the panel have been identified through the coats-of-arms and the initials “C A” visible in the upper part. They are Coloman Helmschmid and his first wife, Agnes Breu. Helmschmid was a member of a leading family of armourers who worked for the Emperor Maximilian, the Emperor Charles V and the Duke of Mantua, while Agnes Breu was the sister of the present artist. The figures are painted in two clearly different styles and using different chromatic ranges, however there are also unifying elements such as the plain background. Coloman’s figure fills more of the pictorial space and is painted in a harder, more linear style than that of his wife, who has softer, gentler features. This double portrait is another example of this format in the collection of the Museo Thyssen-Bornemisza. Although relatively uncommon, there are other examples of such portraits in German art. This panel was in Italy, where it is recorded in the Palazzo Giovanelli in Venice. From there it passed to the Fleischmann gallery in 1930 and was acquired that year for the Rohoncz collection. The acquisition took place before the Munich exhibition when that collection was first presented to the public as it appears in the exhibition’s catalogue. The Munich exhibition brought the previously unpublished panel to the attention to art historians. It was then the subject of study by Hugelshofer, Mayer and Bercken. The two sitters, who share a single pictorial space, can be identified from their coats-of-arms at the upper centre. The one on the left has a cockerel lifting a baton with one of its legs while the one on the right is a half-length, black gryphon. Below this element is a framed cartouche with the initials “C A” in capital letters, which could be read as the first letters of the two sitters’ names. The sitters are Coloman Helmschmid and his first wife Agnes Breu. Helmschmid (1470/1471–1532) was from the celebrated family of armourers of which his father, Lorenz, was the best-known member. Clients of the Helmschmid family included the Emperor Maximilian, Charles V and the Duke of Mantua. Agnes Breu was the sister of Jörg Breu, who painted part of this panel. 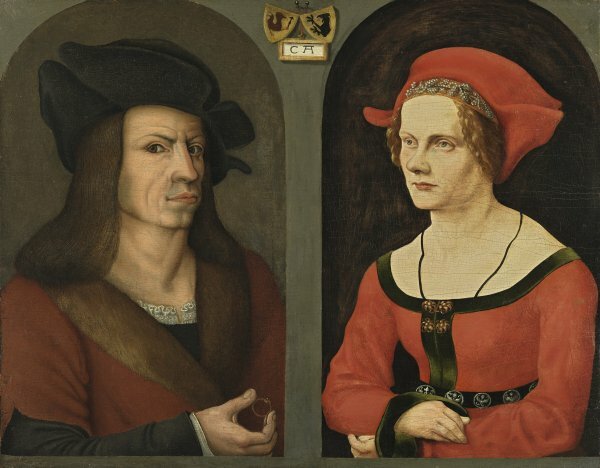 The couple married around 1500, which has been suggested as the year in which this portrait was executed. Colomon was left a widower after only a few years and married again in 1508 to the daughter of the printer Hans Bämler. Since the time of its first publication art historians have detected two different approaches in the way in which the two sitters are painted. It is clear that the figures are of different quality, and there are also differences in the composition and technical resources deployed. Both busts are outlined against neutral but different tones. Coloman fits awkwardly into his space, his body defined with rather simple lines. The colour range is relatively limited and the lines excessively harsh with regard to the face and the lack of modelling in the rest of the body. In contrast, Agnes occupies the space more comfortably and fits more easily into the setting. Her head is more softly modelled, as are the details of her clothes and hair, which is much finer and more natural than the solid area of her husband’s. Lübbeke attributed the image of Agnes Breu to her brother, the Augsburg painter Jörg Breu, but considered the portrait of Coloman Helmschmid to be by an unknown artist.